– The Jeph Loeb/Jim Lee/Scott Williams year long “Hush” arc comes to an end with Batman #619. Did it make sense? Were readers satisfied? How would it alter the Batman universe? 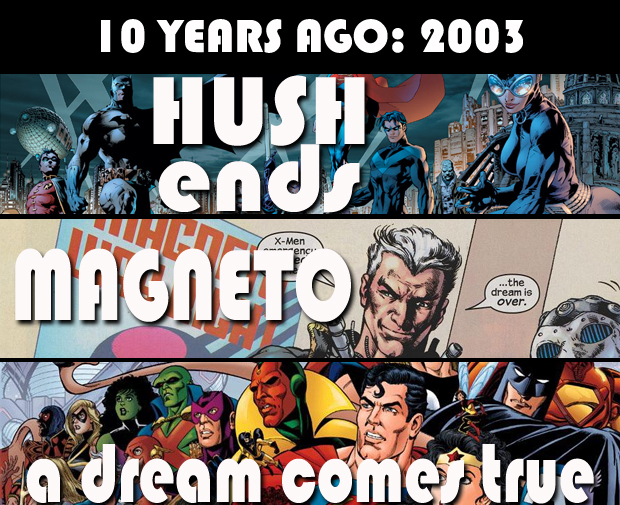 Considering where DC would go for the next 2-3 years, “Hush” could be looked at as a good starting point for readers as the DC Universe moves to both Identity and Infinite Crisis. – Grant Morrison’s New X-Men run lands a twist that, when reread up to the specific issue (#146), made me think: “I should’ve seen it all along”. Did it work for you? – After years of waiting, after pages already drawn, George Perez manages to convince DC and Marvel to come together to finally produce JLA/Avengers. Along with Kurt Busiek as writer, the first issue of Perez’ opus hit ten years ago. If you haven’t already, check out the Comic Geek Speak Footnotes episodes on the mini-series (www.comicgeekspeak.com/search.php?search=jla%2Favengers) where Adam and I dig deep into all of the ins and outs of what was going on in this grand four issue mini-series. – Grant Morrison again! With issue 5 of his Animal Man run, Morrison begins to lay the groundwork for not only that particular title, but for all DC titles to come for the next twenty-five years. 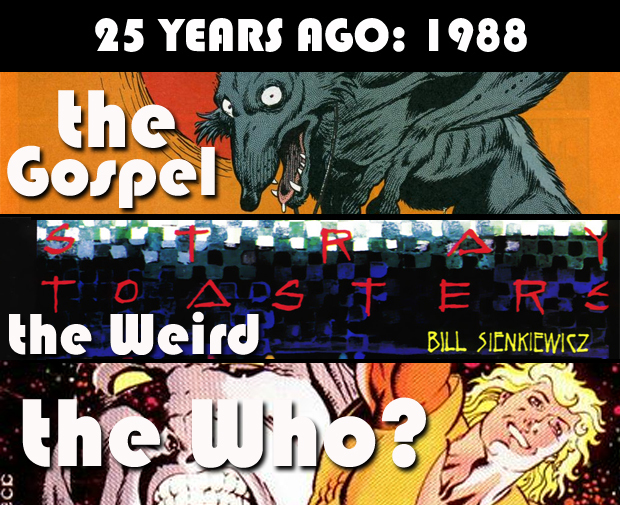 “The Coyote Gospel” was nominated for an Eisner at the time for Best Single Issue. It’s a challenging read even today with its heavy handed (pun intended) look at who controls comic book creations. – Bill Sienkiewicz’ Stray Toasters #1 from Epic hit ten years ago. It sits in my collection waiting to be read one day. – Looking through 1988, I came across this little two-issue Marvel oddity: Solarman #1 by Stan Lee, Mike Zeck, and Nestor Redondo. I’ve never heard of it. I’ve never seen it at conventions. And suddenly I need to own it. OTHER: Conan the King hits issue 50 and the first issue of Phil Foglio’s Plastic Man four issue mini-series is released. 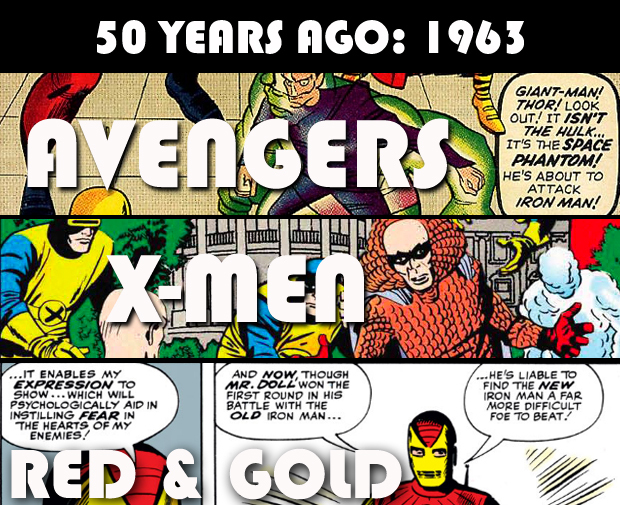 – The second issues of both the Avengers and the X-Men hit the stands fifty years ago helping to push comics into the Marvel Age. Technically, there’s nothing major to note – I just felt that those titles needed to be addressed since I didn’t do a Timeline Tuesday for the months when their first issues actually hit the stands. – With Tales of the Suspense #48, the Iron Man armor starts to add red to its color scheme (it was grey then gold up to now). I love the description of the new look for the mask. OTHER: The Rogue known as Heatwave makes his first appearance in Flash #140 and in Justice League of America #23, the team fights the Queen Bee for the first time. – Debuting a few months after Superman and Zatara and seven issues before Batman, the Crimson Avenger is one of DC’s oldest characters and is billed as DC’s first “masked” hero. After the Crisis, it was more or less a given that, within DC continuity, the Crimson Avenger was the first hero of the Golden Age. A Green Hornet/Shadow clone, the character would eventually be given a more super-hero look and has had several other characters take up the mantle once he was killed off. Considering that his weapons of choice are handguns, I’m not the first to make the connection that the new 52 character of Pandora, who also uses handguns, and has a similar look, could be the new 52’s version of the Crimson Avenger given that she could be viewed as the first character of this new age. Damn. 2003 was a good year. I got completely sucked in to HUSH. I loved the watercolor effects Jim Lee was doing in that storyline. It doesn’t hold up so well now (for me, personally), but I was all-in after I heard the buzz. Magneto – that totally worked for me. The only X-Men run I own (and the only significant run I’ve actually read, though I did read the 2-issue Days of Future Past this year). JLA/Avengers – this was huge news for me, being a Perez fan like you, Pete. And Busiek really brought his A-game to the story. Love that book. And Stray Toasters – the first comic book I saw spotlighted on MTV News, when MTV was still a music channel. That’s how I learned to say Sienkiewicz’s name. And I, too, still have that in my longboxes, waiting to be read. Thanks for spurring some good memories, sir. Glad to have you back. Yea – I have a feeling the coverage of 2003 thru say 06 will be choice. Not so much 1989/90 from what I remember. Standouts for sure, but on the whole I think 03-06 was a better overall time. We’ll see!